I'm participating in the 2nd Annual NYC Fun-A-Day! The premise of Fun-A-Day is you pick a project to do everyday for the month of February, do it, document it in some way, then share your work the following month in a big group show. I'm choosing to "Go Grandma". Everyday this month I'll be either: doing one thing in a way a little more old-fashioned than I'd normally do it, doing something that sassy senior ladies are known to do these days, and/ or doing something particular to one of my own grandmas. I'll be garnering lots of inspiration from Erin Bried's superfun book, How to Sew a Button: And Other Nifty Things Your Grandmother Knew , as well as memories of my maternal great-grandmother Irene (a.k.a. Momma) and conversations with my paternal grandma Madeline (a.k.a. Grandma Lane), who I wish to spend more time with. My inaugural Going Grandma breakfast was oatmeal. Momma had oatmeal for breakfast at least five days a week, if not six. And visiting her meant you had to eat oatmeal too. As a child, I hated oatmeal. It was always so simultaneously gelatinous and lumpy, not to mention cold by the time I finally stopped whining and started eating. Fast-forward 20 years and I love oatmeal! No offense to Momma, but I think I prepare mine better. Instead of plain Quaker Old-Fashioned with a light dusting of white sugar and a spot of skim milk, I made a bowl of steel cut oats tricked out with dried cranberries, pecans, walnuts, chopped apples, maple syrup, and a splash of soy milk. Although my oatmeal wasn't as modest as my great-grand's, I think she'd appreciate the similar spirit of health and thrift. Not photogenic, but still tasty. Today I also took a cue from Erin Bried and planned my meals for the week according to the instructions in her book. (You can read this section on Google Books.) Planning meals for the week is nothing new for me, but this was the first time I took a sheet of paper, made a column for each day, and plotted what dishes I would be making each day. This made it easy for me to open my weekly-planner and plan meals based on Richard's and my activities. I'm pretty sure I saved some money and reduced waste because I almost scheduled a fourth entree until I saw we have a dinner invitation on Monday and realized Richard's birthday is Saturday so we'll probably dine out. As a visual person, I'm not sure I would have considered those things if I hadn't seen it mapped out like that. My final grandma activity was making skillet corn bread. I followed a recipe from The Real Food Daily Cookbook. I can't use my family recipe because I don't eat dairy, but who would miss it? The vegan recipe didn't stray far from the traditional one and resulted in fluffy, moist Southern-style savory (and slightly sweet) deliciousness that would make my Momma proud. As an aside, this bread was at least thrice as good as my first attempt making the same recipe a month ago. I think a great deal of this was due to my swapping out our flour. If you don't remember when you purchased your flour, it's probably not worth baking with. I'm sure your grandma would tell you the same thing. 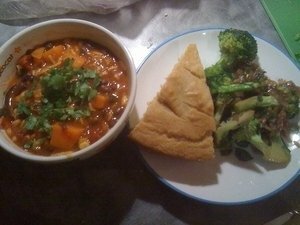 I served the cornbread with Spicy Sweet Potato Black Bean Stew (recipe from ReadyMade) and sauteed broccoli. This has nothing to do with grandmas. I'm just braggin'. Every year I say I'm going to do Fun A Day but I never think of anything good. I should attempt to read a book a day, I am so behind in book reviews. But now this means I have to read 2 a day to catch up! Have you tried savory oatmeal yet? I didn't grow up on oatmeal so I never acquired a taste for it or cared to like it, until a friend put me on to savory oatmeal. 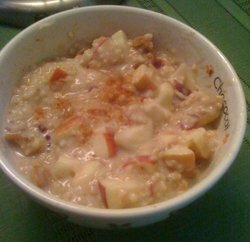 Basically, you add whatever savory flavors you like: salt, soy sauce, etc to steel cut oats and enjoy. It's also a great way to use leftover greens. I add a veg bouillon cube to the oatmeal for more flavor. Oooo savory oatmeal? I have some chard I gotta eat. Thanks for the suggestion!